Earring length is 2 inches. 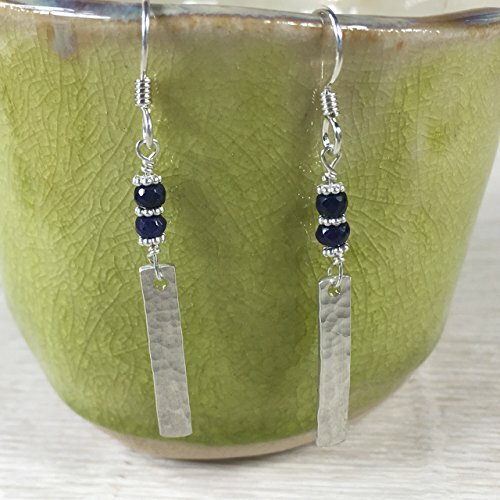 Sapphire comes from the Greek sappheiros meaning blue colour. Infused with the power of integrity, strength, and wisdom, the sapphire has been used by people in power since ancient times. The ruby and the sapphire are actually of the same family and are often found together (both sapphire and ruby are a variety of corundum). "STERLING" is believed to come from the Old Norman French esterlin...meaning little star...and Old English stiere....meaning strong, firm, and immovable. If you have any questions about this product by B JANECKA, contact us by completing and submitting the form below. If you are looking for a specif part number, please include it with your message.